Grilled Cheese Sandwich recipe by Saadia Faruqi at PakiRecipes.com. Heat tawa or fying pan. Butter 1 side of 1 bread slice and place on heated surface with buttered side down. 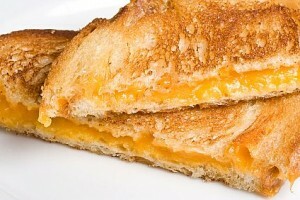 Place cheese slice on top of bread (on unbuttered side). Place another bread slice on top of the cheese and butter the upper side of the bread. After a couple of minutes, turn the sandwich over using a spatula or knife, so that the other buttered side is now on the heated surface. Keep grilling in this manner until both sides are golden brown. Take the sandwhich off the heat and cut diagonally.